The week we now call Holy Week or Passion Week, started with Palm Sunday. Why was this week so important that three of the gospel writers (Matthew, Mark, and Luke) devote a full third of their contents to reporting this week, and The Fourth Gospel (John) dedicates its entire last half? Jerusalem, which had a normal population of about 50,000 at the time of Jesus, had at least tripled in size because of the influx of pilgrims celebrating the Jewish holiday Passover. Early Sunday morning Jesus made his dramatic public entry into the city. This was the end of any privacy and safety his ministry had afforded previously. It marked the beginning of what would be an inevitable collision course with the religious and political authorities: both Jewish and Roman. The procession started at the Mount of Olives, across the land bridge of the Kidron Valley that ran along the eastern side of the city, and through the eastern gate into the city. There is some debate among scholars as to which of the two gates on the eastern wall of the city Jesus would have entered. Located on the northeast corner of the Old City, which I’ve walked through myself, the Sheep Gate is a natural choice from the land bridge and a common gate that Jesus used to enter the city. It was so named as lambs destined for Temple sacrifice entered here. They did not leave alive. For centuries, during Easter Week, Christian pilgrims begin their procession inside this gate. The route is called the Via Dolorosa, “the way of pain” and marks the Stations of the Cross that Jesus followed on his way to Mount Calvary. Others contend that the Golden Gate on the center-eastern part of the city is the one, though it’s currently sealed up and has been for five centuries since the mid-16th century by Suleiman the Magnificent, a sultan of the Ottoman Empire. Jewish tradition states that Messiah will enter through that gate when he comes in the new age to rule. Whichever gate Jesus entered near the Temple, crowds began to gather to see the rabbi from Galilee. The procession began accompanied by shouting and singing from the throngs as they threw down their garments on the pathway to cushion his ride — an Oriental custom still observed on occasions — as well as palm fronds, the symbol of triumph. The Old Testament prophet Zechariah had foretold the arrival of the Messianic king in Jerusalem via the humble conveyance of a colt. Here the crowd hailed Jesus as “the son of David”, a loaded name used at a loaded time. The Bible had predicted that the Messiah would be the son of David. The priestly establishment was understandably disturbed, as the palm was the national emblem of an independent Palestine. These were essentially Jewish flags. What if Jesus should claim to be the heir of King David? Archeological excavations have turned up Roman coins with the head of the Roman Emperor Tiberius but on the other side features a seated woman holding a palm. The inscription reads “Caesar Augustus Tiberius, son of the Divine Augustus. “The coin, referring to Augustus as a god, would be considered idolatrous to the Jewish subjects, hence the presence of money changers at the Temple to convert this Roman denarius, or Tiberius Penny, into Temple money. The “conspiracy” against Jesus by the religious leaders had been building for at least 3 years, and the sources record seven instances of official plotting against him, two efforts at arrest, and three assassination attempts before this time. Indeed, this intrigue was no spur of the moment idea. A formal decision to arrest Jesus had in fact been made several months earlier. The Jewish religious officials were afraid that if Jesus were to continue performing his signs, he would win over the people and the Romans would come in and destroy the Temple and nation. According to legal custom at that time, a court crier had to announce publicly or post an official “wanted” handbill in the larger towns of Judea about forty days before a trial. Small wonder that there was some debate over whether Jesus would dare appear in Jerusalem for the next Passover. This discussion ended abruptly on Palm Sunday with his public appearance. There were political reasons for dealing with Jesus. There had been a dozen uprisings in Palestine in the previous 100 years tracing back to the time of the Roman occupation by Pompey in 63 B.C., most of them subdued by Roman force. Another Messianic rebellion under Jesus would only shatter the precarious balance of authority, break Rome’s patience, and might lead to direct occupation by Roman legions. Religiously, Jesus was a dangerous item to the current establishment. The people were hailing the Teacher from Galilee as something more than a man, and Jesus was not denying or blunting this “blasphemous” adulation. The Pharisees had been bested by Jesus in public debate, being called vipers, whitewashed tombs, and devourers of widow’s houses. Humiliated, they would be only too happy to conspire with the scribes, elders, and chief priests. Finally, there were economic motives for opposing Jesus. Seeing the commercialization of the Temple, Jesus drove the dealers and animals out and turned over the tables of the money changers causing a major disruption in business. There were many reasons for dealing with Jesus. I enjoyed reading a couple of your Holiday History articles. I added myself to follow your blog. This is so helpful. Thank God for you. God Bless. People in the church I attend are reading a book called The Last Week by Marcus Borg and Dominic Crossan. 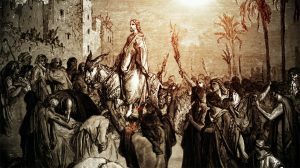 They describe the Palm Sunday procession coming into Jerusalem from the east, and a Roman procession coming into Jerusalem from the west at the same time on the same day. The book has no bibliography, and I cannot find any reference to this anywhere but my research skills are not all that well developed. I am wondering if this is common knowledge? or are they writing historical fiction? Can you help me? I’m not familiar with the book you mention, but this is probably accurate. Jesus entered Jerusalem from the East. He’d been in Bethany, beyond the Mount of Olives”. He would have entered though either the Golden Gate or the Sheep Gate. The Sheep Gate is still open today in the north east corner, and would point to Jesus being the Lamb of God, as lambs destined for sacrifice at the Temple entered there. Alternatively, Jewish tradition says that Messiah will enter through the Golden Gate east of the Temple, and as Acts Chapter 2 records the angels saying that Jesus would return in the same way he left… then He would land on the Mount of Olives and enter the city through the Golden Gate (Beautiful Gate). We do know from history that during the Siege of Jerusalem in 70 AD, Roman Legions approached Jerusalem from the West. They laid siege in the west north of the Jaffa Gate. I discovered by reading the story in the Bible that Jesus entered Jerusalem many weeks before his crucifixion. Notice that he taught in the temple every week for a large number of weeks before Passover. So why is it that the tradition says he entered Jerusalem the Sunday before his death? Also why Sunday, there is no evidence that he entered on Sunday or was resurrected on a Sunday, as the first day of the week back then was not Sunday. The people in Jerusalem didn’t have a week beginning with Sunday, but any day that followed the Sabbath of the feast of unleavened bread. This Sabbath was the day following full moon and not a Saturday or a Sunday as Jerusalem did not have ordinal week days until a thousand years later. I’ll answer your first question. While many had “gone up” to Jerusalem (John 11:55), at this time Jesus was outside the city proper. Following the raising of Lazarus from the dead Jesus had withdrawn from public to the northwest of Jerusalem in the area of Ephraim. We learn from John 12:1 that he was about 1.5 miles east of the city in Bethany (likely the modern day West Bank city of al-Eizariya) at the home of Lazarus, Mary and Martha for 6 days before the Passover. He approached the city from the east, the Mount of Olives, and entered through one of the city gates on a donkey. There is some debate about which gate. The Golden Gate is traditional, and prophsey says Messiah will come through there in the future. However, that gate is now bricked up. The Sheep Gate slightly north of there, on the north east corner of the modern city wall is open, and I’ve passed through it myself. Arguments in favor of the Sheep Gate are related to the “Lamb of God” who takes away the sin of the world.